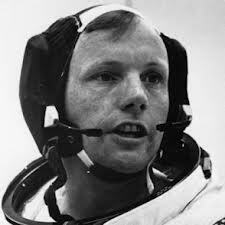 A month ago, in 1969, Neil Armstrong was the first human to step on a surface beyond the Earth. With his passing today we lose a part of our own history, with the man who took that "giant leap for mankind." Many of us can remember sitting in front of grainy black and white televisions as the spectacle unfolded to the measured voice of Walter Cronkite. Even as little a kid, I realized that the world had just changed. Humans had broken a barrier and opened up the stars, or at least the first step towards their distant light. We honor today not only Neil Armstrong's pioneering spirit, but the aspirations he created in so many to pursue the sciences, engineering and much more. There were many others in the Astronaut Corps, and many behind the scenes without which none of the landings could have been achieved. Here, then is to the first of many that took us beyond our planet, who inspired others, and lived a life of contribution. Neil Armstrong was 38 years old when he took that step, and 82 when he died.